DIFFERENT=AMAZING is drawn from real-life bullying experiences of elementary students, including current students from Salt Lake City and Davis School Districts. The goal is to provide students with the tools to identify, address and hopefully prevent bullying in their own schools. Inspired by the 2010 event of the same name. Featuring Tyson Baker and Latoya Rhodes, directed by Jerry Rapier. Special thanks to Jim Martin and Denice Maedgen. Our students and teachers absolutely loved the assembly. It was very valuable and enlightening for them. Thank you so much for coming. It is each school’s loss if they are not having this assembly. It shows how powerful the bystander can be. 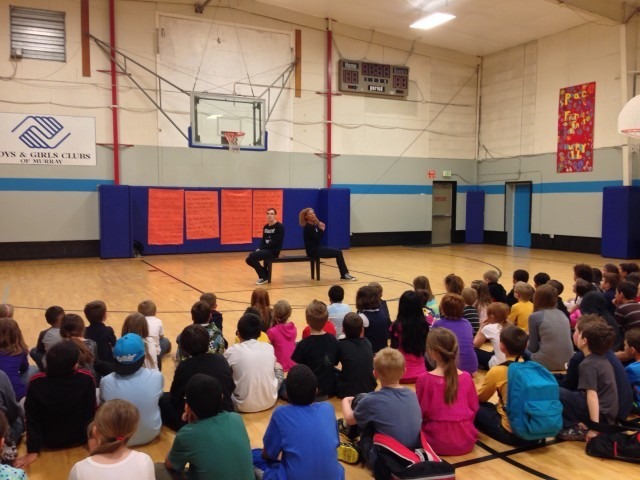 One of our 5th grade teachers came in at the end of the day to tell me her students thought it was the best anti-bullying assembly they had ever had. Following the assembly I asked teachers to return to their classes to process what they had heard. In this particular teacher’s class she said one her students was sharing a personal story and started to cry. She said it opened the door for other students to share and discuss the topic of bullying and their personal experiences. We definitely needed this at our school. The assembly opened up a dialogue among faculty and staff about better and more systemically addressing issues of bullying and harassment through the curriculum. We thought your show was great. The issues you addressed were very relevant to our students’ lives. Your stories were a great way for kids to hear what they deal with so that hopefully they can think about them from a different perspective. Having DIFFERENT=AMAZING come to our school was beneficial for our students. For them to be able to see a set of fine actors perform stories that share vulnerability and sheer honesty about issues of bullying and discrimination is important. It lets students identify and reflect about their own choices. It tells them that they can be a positive force or a hurtful one and it all begins with them. Students can feel looked over and unnoticed by teachers and adults, yet this play gives the students stories a chance in the spotlight. It was a positive experience for the students at our school and I hope that we can see more productions like this in the future. Art Access strives to reach as many people as we can, adults and children, in all sectors of life. The beauty of DIFFERENT=AMAZING is that it has a universal feel to it. The script successfully appeals to a variety of audience members on several experiential levels. The play encourages its audience to respect differences among all people and forces empathetic responses through the audience’s ability to relate to the stories performed. DIFFERENT=AMAZING is a valuable resource for parents and teachers, as well as children, because it illustrates how to respond to situations of bullying. Kids frequently interpret a lack of response to mean that bullying behavior is acceptable. This play demonstrates the behaviors and attitudes that one would hope children to develop, paying particular attention to situations that can either promote prejudice or inhibit a child’s openness to diversity. It’s important to let children know from a very early age that bullying and name-calling of any kind is hurtful and wrong. Finally, this play encourages parents to provide their children with opportunities to interact and make friends with people who are different from them. The brilliance of the text and the actors’ portrayals is in convincing the viewer that these are a children’s words. It reminds me of so many children I have known, and of my own childhood (and adulthood) experiences with bullying. It was wonderful to have DIFFERENT=AMAZING come to our school. 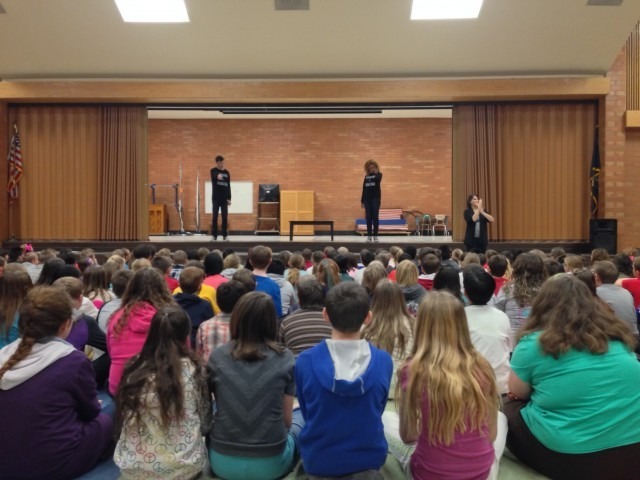 The actors were very engaging and and performed some complicated themes in a very accessible way for our students. The next day I went into the classrooms and asked the students what they learned from the play. The responses indicated that they had a clear idea of the subject matter and the potential negative impact of bullying. Every year by law, schools in SLCSD need to review anti-harassment policy with every student. Our message is from Steps to Respect curriculum – the 3Rs – Recognize, Refuse, and Report. I often bring in an impactful picture book or video to get kids thinking. This year we brought in DIFFERENT=AMAZING. 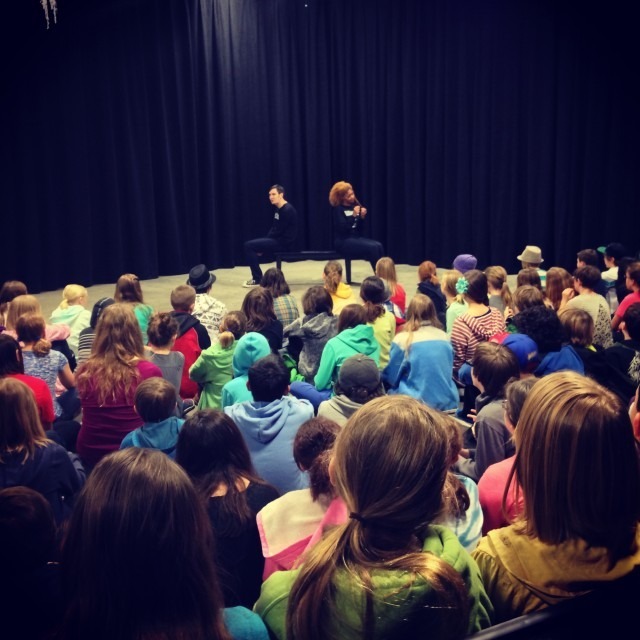 The actors had 300 kids rapt attention all through the performance. Many kids were surprised that these were real stories. Thank you for reinforcing the message that DIFFERENT=AMAZING!